If you are searching for “buy here pay here phoenix“, “500 down payment car lots“, “buy here pay here dealerships“, “cars for 500 down payment near me“, “buy here pay here near me“, “buy here pay here phoenix 500 down“, “500 down car lots phoenix az“, “500 down and drive“, or “buy here pay here dealerships near me” in Phoenix, In-Power Motors 4 can help! Stop by In-Power Motors 4, LLC at 1009 E. Hatcher Rd. Phoenix, AZ 85020 today, give us a call at (602) 368-7171, or search online to find $500 used cars, trucks, and SUVs to fit your budget. We work with no credit or bad credit car purchases all the time. All you need is the $500 down payment and a choice of car to get started. Our #1 goal is for you to be so happy with your used automobile purchase that you will tell all of your friends and family about our dealership and will come back and see us when it becomes time for your next used car or truck purchase. Customer referrals and great reviews are the hugest compliment we can receive. Shop $500 Down Used Cars Now! The most popular queries used to find our $500 down cars in Phoenix include: buy here pay here near me 500 down, 500 down cars, 500 down car lots, cars for 500 down payment near me, 500 down payment car lots near me, $500 down car dealerships near me, cars for 500 down and 500 down used cars phoenix. Buy here pay here in Phoenix is one the easiest way to buy used cars if you don’t have credit or a large down payment. 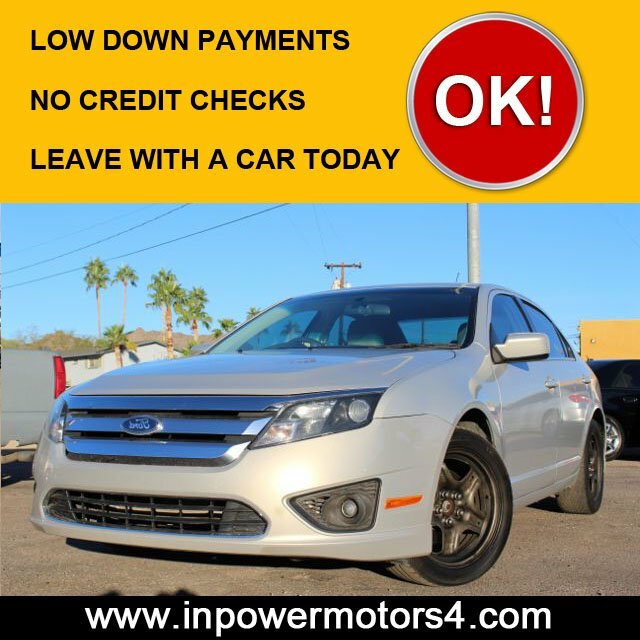 At In-Power Motors, LLC, we have 4 convenient buy here pay here car dealerships in the Phoenix Valley to serve you, 3 in Phoenix and 1 in Apache Junction. Walk away today with a used car for as low as $500 down payment and low monthly payments. If you are searching for 500 down car lots near me in Phoenix, In-Power is the best of the best! Not everyone has the good credit but you still want to need to buy a used car. We offer in-house vehicle financing that allows our car and truck dealership to approve anyone with bad credit. 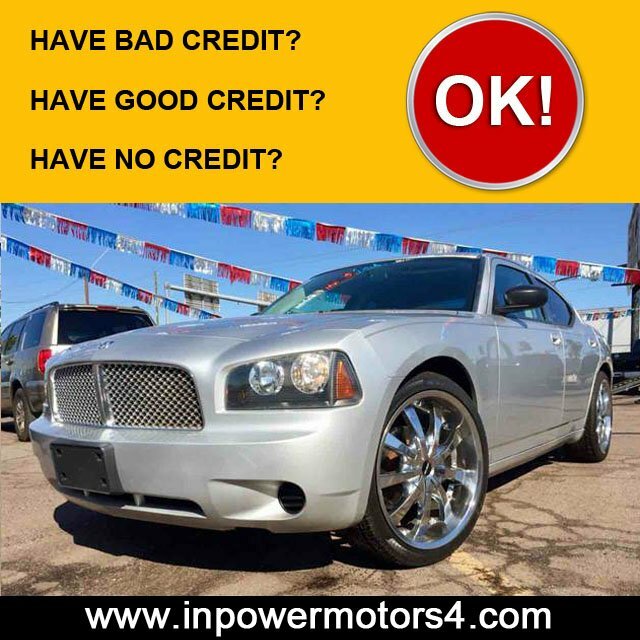 In-Power Motors 4, LLC is the best $500 down bad credit used car dealer in Phoenix. We are one of the only 500 down used car dealerships in Phoenix that offer no credit check car sales and work with buyer with bad credit! We help car buyers get great deals on used cars no matter what type of credit they have. We even offer in-house financing that allows for us to approve just about anyone. We consider ourselves the best no credit or bad credit used car dealer in Phoenix! Stop our inventory of buy here pay here and 500 down used cars in Phoenix clicking the links below. *Please remember that our inventory changes all the time. We may not have every car or truck model listed below in stock or in the $500 down buy here pay here category. Also, their may be qualification rules for the $500 down promotion but almost all of our vehicles qualify. Our inventory changes nearly everyday as we are purchasing and leasing used vehicles every day. Feel free to look at our online inventory online and see if you can find a vehicle you like or stop by our dealership to see the vehicles in person. Then submit an online financing application request or contact us to schedule a test drive. You can apply for buy here pay here financing with In-Power Motors 4, LLC online. It’s easy to apply for a no credit car loan with In-Power Motors 4. Simply use the links in this text to guide you to our loan application page. Fill out the required information and submit it to us. We will get in contact with you shortly after submitting your loan application. Loan application info includes: Name, City, Address, Email, Date of Birth, Phone Number, DL number, Rental Information and Employer information. Read our 5 star reviews on Google & Facebook. We have 4 $500 used car dealerships in Valley to serve you! Stop by In-Power Motors 4, LLC at 1009 E. Hatcher Rd. Phoenix, AZ 85020 today, give us a call at (602) 368-7171, or search online to find $500 down used cars, trucks, and SUVs to fit your budget. View even more buy here pay here Phoenix $500 down cars & trucks at our other location on 2301 West Buckeye Road Phoenix, Arizona . Buy Here Pay Here 500 Down Cars Near W. Buckeye Rd. Buy Here Pay Here 500 Down Cars Near Indian School Rd. 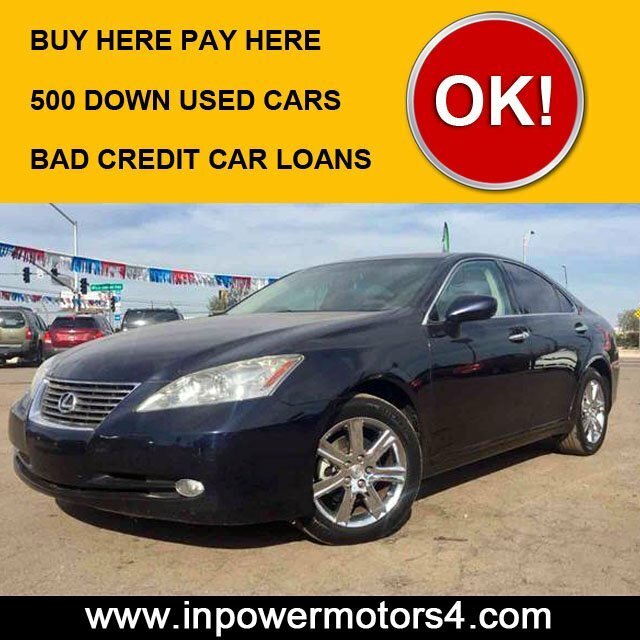 If you are at one of the following used car dealerships in Phoenix and can’t find an affordable vehicle, stop by In-Power Motors 4, LLC to shop our inventory. We have provided directions to our location from the most popular spots in Apache Junction. Click below to be taken to the directions for your location. Buy here pay here or BHPH is a phrase used by car dealerships that offer in-house financing. With in-house financing you can finance a car and make the loan payments at the same dealership. A used car salesmen would say “buy the car here, pay for the car here“. BHPH dealerships normally work with individuals that have no credit or bad credit. As long as you can prove you make enough income and have a drivers license, most BHPH dealerships will offer you in-house financing to purchase a used vehicle. Apply for in-house financing online. 500 down means $500 down payment. $500 down is a term used by buy here pay here car dealerships who only require a $500 down payment for you to be eligible to purchase a used car. Jose and Hector are awesome!! I highly recommend them! Their customer service is top notch and they absolutely help you to the fullest! Five stars isn't enough! These guys down here at In Power Motors 4 are awesome. They worked with me, finally got to drive off the lot and keep my family happy  you guys are the best...Shantel, Pablo, & Hector! Thank you guys much God Bless!!! Bought a good quality, used car for the first time with them the other day. I have no credit history prior to going to this dealership. Jose helped me out with everything and answered all of my questions honestly! The crew here really made me feel comfortable buying my first car, and they got me a good deal too! Definitely recommending to anyone who is in need of a car! Got my car there they were amazing amazing amazing. worked with my credit and left with a car I wouldn't even dream I could have. They are amazing if I could do 10 stars I would. I defiantly recommend friends and family. Thank you Gus, Jose, Hector and Pablo. Thank you to the AmAzInG staff at this location. It was a breath of fresh air going somewhere that "Spoke my language". Dave was so helpful and real about the whole process. Jose is an amazing young sales man who kept it real. Thanks again for putting my family in a safe, powerful and comfortable vehicle today. I will send everyone I know to you guys. Thanks again. Bought our first car here! Service & staff were very welcoming. I would highly recommend it to my friends & family. Lots of my family bought from here already. We love them! Affordable prices, & work with you on anything! We couldn't have been more happier with our first vehicle. All thanks to the best sells men, Jose(The Champ) & Dave!